Every week I hear from new entrepreneurs asking for advice in starting their new business. That’s why I wanted to answer one of the most common questions I get asked! I need some advice and I don’t really have anyone to get it from. My names Luke, a 1st-year business student at STFX University in Canada. I love it here; the university is fun and I’ve met so many people already… However, I don’t think I should be here. As an aspiring entrepreneur, I want to create something, own it and call it my own. With the unique idea I have, I know I could succeed, but I’m just so impatient; It doesn’t seem logical to wait four years to start something. Telling my parents I have been thinking of leaving university has been difficult. And as expected they seem disappointed, shocked, and quite the opposite of understanding. They are pushing me to stay, but I think that realizing that university isn’t for me is a very mature stance. So I write to you for simply this; what should I do? Do you have any advice? Am I being rational? Realistic? Anything you have to say about this situation is greatly appreciated. Here’s an interview I did back when I was 22 answering a similar question! I just want to talk about this a bit more and expand on the video above. Dropping out of college is extremely personal and not something you will figure out with a simple google search. Take in all the information you can and make a decision afterward with your family. In the past, without a college degree, we would all be considered failures. But right now, people are graduating from college now and don’t know how to do anything. Everything they know has to do with memorizing and studying. Both skills don’t necessarily apply in the real world. The real world wants people who can solve problems. The real world needs people who can look at a problem and find the right answer. You don’t have to know the answer but you need to be honest enough to go find someone who does and take actions to solve the problem. That skill set is not something you learn in school. A college degree seems like the safest thing to do but I would argue that it’s the riskiest thing. You can graduate college and find a job just to figure out you hate the path you chose. Then what happens if you stick with the job you hate because you already invested too much in earning that degree? Take your time and figure out in your own time what interests you. There are so many paths for you to take that it can seem impossible to know so early in your life. Before you do anything, you need a plan to make sure that you’re making this decision with nothing in place. Let’s think about the costs of education. Is it currently worth it to borrow $40,000 for a degree that you’re unhappy with? Again, that’s a personal discussion you have to have with yourself. Personally, I don’t think that is but instead of dropping out is there a way to lower your costs? It’s never the flashy ideas that are the most logical ones. You don’t need a mountain of debt to finish your degree. Sometimes we want to drop out because it doesn’t make sense to keep wasting money. I’ve seen local community colleges or smaller local colleges offer $100 per credit. It might take longer but it’s possible to switch schools and lower your costs to get a degree by a lot. Just that alone might take the pressure off of feeling that college isn’t worth the price. Local community college or local small public college might just be what you need to feel more in control. And with costs lowered you can work more and pay your way through! I’ve personally never hired anyone and looked at what college they went to. I look at their resume for work experience depending on the position. Most jobs don’t care where you went to school. Another option to consider is lowering the number of credit hours you’re taking. When things get difficult our first instinct is to quit or think we’re in the wrong place. It’s almost like an imposter syndrome. But you can cut your classes in half and become a part-time student. What’s the law against that? Imagine yourself with a lighter course load so you can focus on fewer classes. You might not feel as overwhelmed or stuck and you can save money. Take that extra time and apply it to something that will get you ahead. With half the amount of work to do you can get an internship or job. It’s a great way to save money, make money and get your sanity back. When people drop out of college it doesn’t mean everything is lost forever. Put your enrollment on hold because you can always go back and finish. Take a few years off, work, gain experience, save money and pay your way through. Remember, nothing is permanent. You can take time to figure out what kind of job you want and start gaining real-world experience faster than any of your friends still in school. It doesn’t make sense to stay in school against your will when you can potentially be more productive in the real world. This isn’t because you’re lacking motivation. In fact, taking some time off to work can motivate you to work like a crazy person and save a lot of money. One of the biggest things you can do for yourself is to quickly take action when you’re feeling stuck. The skills you learn working will make school seem like a breeze when or if you go back. Again, dropping out of college is not the end of the world because you can always re-enroll the moment you’re ready. Here’s a cool stat: 14% of the people working in google don’t have a college degree. That was back in 2015 and the number is rising. Right now, you can find jobs at large corporations or cool startups without a college degree. You can start working right now and move your way up before people start to leave school. Look, huge companies are hiring people without college degrees. There is no shortage of companies just looking for motivated people to help them win. A college degree doesn’t mean someone is smart or a hard worker and companies are starting to realize that. There are companies willing to pay the right person a bonus if they drop out of school and work for them. Look all around you at every single business that could use someone like you to make their business better. You can be more productive in the real world and not stuck in a classroom. Look for job opportunities everywhere. Here’s a startup called Praxis. Their only purpose is to connect students with apprenticeship opportunities at fast-growing startups. It doesn’t matter if you’re looking to take a gap year, a college dropout or college graduate, they want to help you find a job. You have opportunities everywhere to do anything you want to do. What makes this decision scary for people is the thought of what everyone will think. But it doesn’t matter. They’re not the ones living your life and they’re not the ones paying your bills. When you look back at your life are you even going to remember the people who you were afraid would think you were a loser? Probably not. You’re going to remember all the things you did and re-live the great memories. Without any debt, the amount of money you need to make to cover expenses is very small. Most people NEED to work so they can pay back the huge student loan bills. If you were to drop out and get an incredible job WITHOUT debt, you’re not a slave to anyone. So who’s the real loser? The point is, you need a plan and you need to make sure you’re confident with your decision no matter what people think. You don’t need a college degree to start a business. And sure as hell, you don’t need a business degree either. What you need is to sell your idea to people. One of the easiest ways to start a business is to go out and make sales. You go out and find 10 houses willing to pay you $100 per month to come and cut their lawns. Now, take that $1,000 and pay someone to take over the lawns for you and find more houses. Rinse and repeat. Every single service based business starts out like that. Cleaning, detailing, babysitting and hundreds more. You can start a service business while you’re in school and when it gets too busy you can focus on the business full time. Any skill that you know can be turned into a profitable business. It’s one of the lowest cost ways to start something. Are you a good writer? Do you know how to work with WordPress websites? I used to run a company called Clear and Presence Media and what I did was go to small businesses and ask them if they needed help being found online. So they would hire me for $1500 per month so I could run their digital marketing. There’s a skill you currently have that people would be willing to pay you for and you can just be sitting on it right now. If you were a great student in high school, you could be a private tutor. People are willing to pay huge money to make sure their kids succeed. Starting a business might seem scary or foreign at first but take some time and think about if there are any skills that you would love to make some money with and get after it. It’s not forever and you can always roll one business into another. Like I mentioned earlier, sometimes the best ideas are not the “prettiest” ones. There will always be a need for skills in specific trades. Roofing, contracting, mechanics, and manufacturing. I’m in Florida and it seems like everyone has a boat. There are jobs all over the place fixing, detailing, driving or selling boats. If there’s something your passionate about you can bet that there is a huge service industry for that thing. There are people who just manufacture parts for high-end airplanes. It’s not the engineers making the parts, it’s a machinist with the technical knowledge to physically create the piece from a hunk of metal. To learn a trade, any trade, you don’t need a college degree. You just need to talk to someone doing it and become an apprentice. Tradesmen can make more money than college graduates without debt! It’s up to you to figure out the route you want to take but there’s a lot of room out there for people who know how to keep the world running. We never think of these things until our lights go out or the backyard deck breaks. There’s enough room for you too! Now this one is cool and we just had to include it because I’ve never seen anything like it before. Certification programs exist in fields where the education system hasn’t caught up with demand. Mainly technology, and that’s a great thing. That means there are companies that only want to know that you know how to solve their problems. Google has come out with an IT Support Professional Certificate program that prepares you for a career in IT in just 8 months. I wish I was making this up. You get the knowledge necessary to make at least $50,000 per year with virtually no debt. There are certificate programs all over the country that focus on low-cost education that teach you a specific skill. And some companies are in such desperate need to fill the roles that a Bachelor’s degree is not necessary. These types of programs are worth looking into. To sum up, everything we’ve talked about in this article I love this Ryan Holiday quote the best. Because the truth is, there is no wrong decision. There’s regret and personally, I would rather risk something and be wrong. There’s nothing worse to me than looking back and wishing I could have done something different. Remember that stats don’t always tell the whole picture. It’s helpful to know that you’re not alone in thinking about making this decision but it’s also important to understand that you’re not one of these people. Stats should be used to more informed and to understand the whole picture but it’s ultimately up to you and what you think is best for your life. 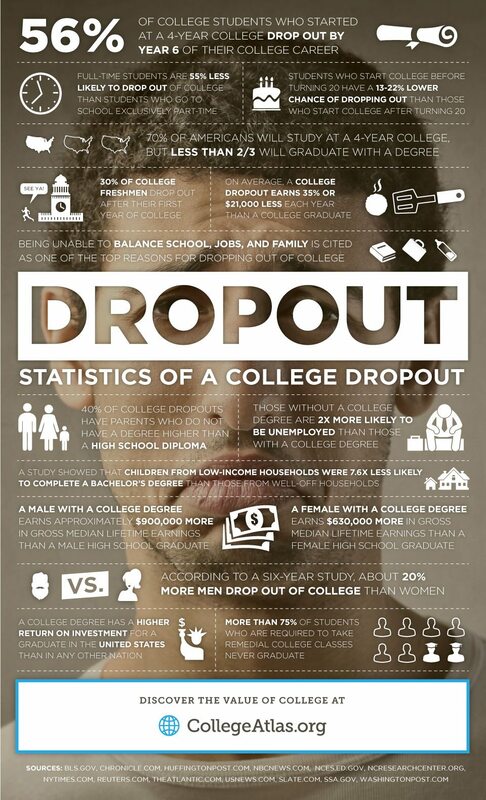 Dropping out of college is something you should plan for and talk to your family about. It’s not something that can be or should be solved with a google search. But personally, I’ve been there when I dropped out of Florida Atlantic University. I bet on myself and I worked harder than I had ever worked before. If you think that you’re wasting time and you can be more productive helping a company thrive then maybe dropping out is for you. The important thing is that you create a plan before anything else. Remember, if you decide to leave school, leave the door open to be able to go back if you ever want to. You’ll learn more about yourself throughout this journey than in any other time in your life. Consider all your options and do what’s best for your life. We love hearing from you all so comment below and tell us what you’re thinking of trying first. And if you have any questions you can also email us at [email protected](dot)com.